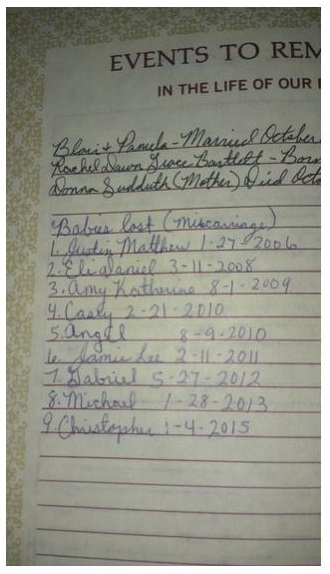 A pro-life woman who has been pregnant 10 times but tragically lost 9 of those babies to miscarriage has recorded their names in her family Bible. Pamela contacted Life Dynamics through our twitter page in response to a story we posted on miscarriage. She shared how she and her husband have lost 9 children to miscarriage and she has each one of their names written in their family Bible. “I just lost our ninth last month. We named every one, and I wrote their names in our Family Bible,” she tweeted to Life Dynamics. “In January of 2006, I miscarried our first baby three months after My husband Blair and I were married,” Pamela told Life Dynamics. Pamela said that it took the couple 7 months of trying to get pregnant again, “Our daughter Rachel was born at 33-weeks, perfectly healthy,” she said. When Rachel turned 1, the couple began trying to conceive another child, she said. Sadly, Pamela and her husband lost that baby at approximately four weeks gestation. “This seems to be the pattern for us,” Pamela said. “I have managed to GET pregnant (including Rachel) – TEN times now… I just can’t seem to STAY pregnant,” she said. Pamela said that doctors cannot tell her why she is able to conceive but unable to remain pregnant. 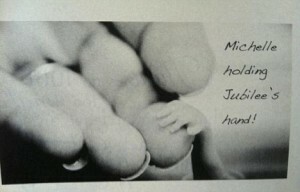 Pamela said that during her eighth pregnancy the baby managed to hang on for five and-a-half weeks before they lost the baby, which they named Michael. Pamela’s last miscarriage happened this January and she said that she grieves because she does not think she will have more opportunities to try again. Pamela follows a long list of women who grieve the children lost through miscarriage. There are even websites online where women post pictures of these children. The story of a child miscarried at 14 weeks has gone viral recently after his parents posted his pictures online. Michelle Duggar from the TV show, 19 Kids and Counting, was 19 weeks and 1 day along, when she miscarried her child. The couple was criticized after posting a picture of their baby to social media. The family named the baby girl Jubilee Shalom Duggar and decided to conduct a funeral service to remember her short life. Naming a child lost through miscarriage is one more way to affirm the humanity of every child created by God and it testifies to the reality that women know that what they have lost is, in fact, a baby.